The theme for the National Catholic Schools Week 2017 is “Catholic Schools: Communities of Faith, Knowledge and Service.” The annual observance starts the last Sunday in January and runs all week, which in 2017 is January 29-February 4. Schools typically celebrate Catholic Schools Week with Masses, open houses, and other activities for students, families, parishioners, and the community at large. The logo and theme, developed for NCSW, was in response to member requests for a theme and logo that would last more than a year, the new theme will be used for at least three years. This will provide opportunities for schools to brand the week and their ongoing marketing activities with repeated mentions and use of a consistent logo. The theme encompasses several concepts that are at the heart of a Catholic education. First, schools are communities—small families in their own right, but also members of the larger community of home, church, city and nation. Faith, knowledge and service are three measures by which any Catholic school can and should be judged. The logo features a swirl of colors interacting around a cross, which is at the center of all Catholic education. 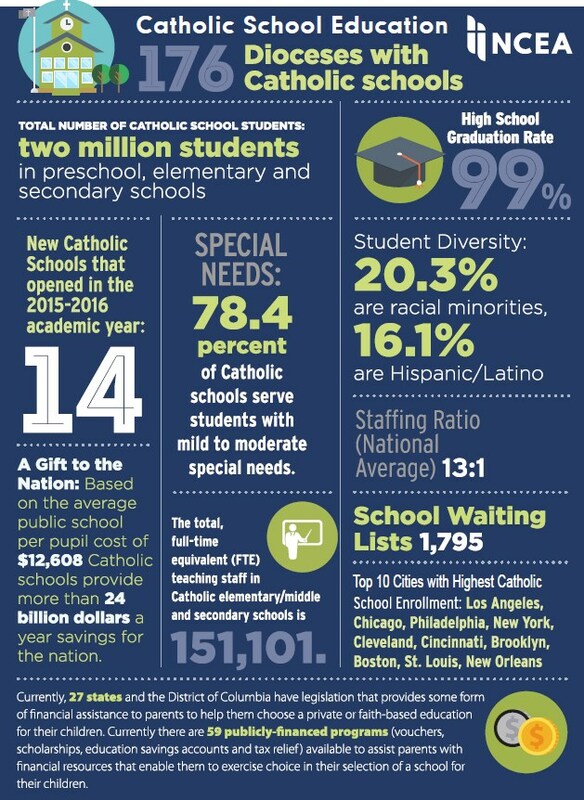 The vibrancy of the colors and the movement and shadows in the logo portray the inner-connectivity and community life that are present in our Catholic schools.